The factory assembled fan head is equipped with a 12 foot long cord and connector. To turn on fan, plug it in; to turn off fan, unplug it. A cord and connector is not supplied with three phase motors. These fans will need to be fitted with an appropriate cord and connector or hard wired directly to a power source. It the fan is supplied with finger guards, the rear finger guard will need to be partially removed to access the motors internal wiring. Remove all but one of the self-tapping screws and place them in a safe place. You will use them again. Rotate the guards around on the single self-tapping screw. Wire the fan. Replace the guard using the saved self tapping screws. 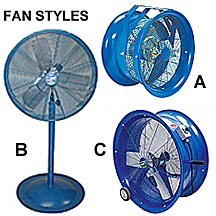 When looking at the front of the fan, the blade should be turning clockwise. It it does not, the electrical connection wires may need to be reversed. If reversing the wires does not work, contact your factory representative. Please read carefully before assemble, install, operate or maintaining any Patterson Fan Product. Protect yourself and others by observing all safety information. Failure to comply with instructions could result in personal injury and/or property damage. Retain instructions for future reference. Disconnect power source before installing or servicing. Failure to disconnect power source can result in fire, shock or serious injury. Patterson products should be installed and serviced by qualified technicians only. Follow all local electrical and safety codes, as well as the National Electric Code (NEC) and the Occupational Safety and Health Act (OSHA) in the United States. The unit should be installed, protected and fused in accordance with latest issue of the National Electrical Code, MEMA Standard Publication No. MG2 and local codes. Motor must be securely and adequately grounded. This can be accomplished by wiring with a ground, metal-clad raceway system, using a separate ground wire connected to the bare metal of the motor frame, or other suitable means. Always disconnect power source before working on or near a motor or its connected load. Lock open position and tag to prevent unexpected application of power. In accordance with OSHA requirements, Guarding is required if unit is mounted less than 7 feet above floor or where workers have access. Keep hands and clothing away from moving parts. Be careful when touching the exterior of an operating motor; it may be hot enough to cause injury. This condition is normal if operated at a rated load and voltage and built to operate at higher temperatures. Protect power cable from coming into contact with sharp objects. Do not tangle power cable and never allow cable to come in contact with oil, grease, hot surfaces or chemicals. Make certain that the power source confirms to requirements of your equipment.